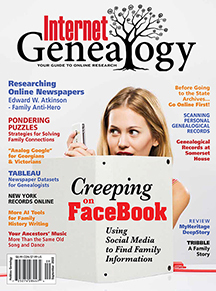 News and information from Internet Genealogy, Your Genealogy Today, and History Magazine. It is said that memories can be evoked in many different ways: sights, smells and sounds, to name a few. While scanning my e-mail the other day, I came across a message from a prospective author and amateur genealogist. They were offering an article detailing their work on helping their spouse find his father’s family. The article subsequently arrived, but it had been misplaced in my e-mail and was recently rediscovered. I don’t want to get into too many of the details, because the article will run in an upcoming issue, but I do want to share some of what I believe is the power of family history, not necessarily your own, to trigger memories one’s past. What struck me in the body of that completed article was a mention of my own hometown in Central Ontario, Canada. That I recognized the family name didn’t do anything to dampen my curiosity either. I suddenly found myself becoming fascinated with someone else’s family history because it triggered a particular memory: specifically of the day of my grandfather’s funeral in 1970 and going to the local shoe store with my father to buy a pair of new shoes for the that sad occasion. It also brought back many happy memories of my grandfather in life. How in the world does that have anything to do with genealogy you might ask? A link in the article led me to a family history website that contained information on a line of the family that had settled in my home town in the late 19th-century. A great many other references to my own home town and surrounding area began popping up with great regularity: my boyhood church, familiar names of local people, historic sites and businesses of the day. Memories began flooding back and I found myself digging deeper. Peeling back the layers, I came across a reference to a business owned by one of the ancestors in question: a footwear store. The store dated back to the late 1890s — more than 60 years before my own birth — and was passed on to a son of the owner after his death in the early 1930s. Along the way, I found references to the son’s service in WWI, along with a photograph and an image of a WWI draft card. According to the narrative on the website, the son continued to operate the shoe store until his own death in the mid 1970s. I can barely remember the day in April 1970 now, but the stranger’s family history discovered through a wayward e-mail and the pair of shoes purchased years earlier brought back a flood of memories that have left me with a new-found appreciation of the importance of recording family history research for future generations. I know many of you in the genealogy world are aware of my recent fight with prostate cancer, but I just wanted to let everyone know that I am doing fine and I received an excellent report on my recovery from my doctor on September 1, 2009. The surgery took place on July 9 and was deemed a success at the time. A pathology report on July 27 confirmed that the early stage tumor was confined to the prostate, had not spread to any neighboring tissue or to any lymph nodes: more good news. I received a copy of that report on September 1. On October 6, I received the results of a PSA test taken on September 3 and the result indicated a level of 0.01: the lowest reading possible and another sign that my recovery is going very well! It was a long haul from May 5 when I sat down in the chair of my doctor's office to hear the words every man dreads: "The bad news is that you have prostate cancer." My first words in response were, "Where do we go from here?" I was surprised by the positive results of biopsies that were taken nearly two weeks prior but it was not unexpected. My father passed away from an agressive form of prostate cancer in 1997 (diagnosed in 1995) so I knew my chances of being diagnosed with prostate cancer at some point were greater. Shortly after my father passed away, I started regular yearly prostate check-ups at age 40. Slightly more than 10 years later I sit here typing this and I thank my lucky stars that I was vigilant about that regular testing. I would like to say to our male readers of our magazines, this blog, and everywhere that early prostate cancer testing can definitely save your life. Men, in general, don't like having a manual, or digital, prostate examination. However uncomfortable or embarrassing it may seem, the alternatives down the line can be much more so. I chose to have a Radical Prostatectomy (complete removal of the prostate) because I felt that my family history in this area presented enough of a risk that any other treatment might not result in a favorable outcome. My doctor was in agreement with me on that point. There were other less invasive options available to me, but I have an excellent urologist and surgeon who made sure I was informed of all possible treatments and their side-effects. I was completely comfortable with my decision. Should you find yourself in my position, faced with the reality of a positive test for prostate cancer, be informed as much as possible as to all the available treatments. Talk to your doctor and ask lots of questions. Between appointments, keep a written list of questions or concerns you have, and go through each one with your doctor at your next visit. Don't leave with questions unanswered or concerns not addressed. Ask for any relevant reading material they may have or for a recommended list of reading material. There are many excellent publications available and I've included two below that I would highly recommend. Take comfort in knowing that great strides have been made in prostate cancer research and the options available to patients are much better today and getting better all the time. Use the Internet, but don't rely entirely on it for your information: there are good sites and not-so-good sites and you can easily get overwhelmed. Be wary of anyone selling herbal remedies with claims of solving all prostate problems and discuss taking any such remedies with your doctor. You may also want to seek out prostate cancer support groups in your area. These organizations are an excellent way for men to exchange information and get support from others who have faced the same challenges. Your doctor or urologist may have information on such organizations available in his waiting room, through the receptionist, or check on the Internet. Lastly, you'll need a strong support system from family, friends and colleagues. You need to remove yourself as much as possible from day-to-day stress and focus on your surgery and recovery. In particular for me, my wife, daughter, another immediate family members and workmates were mainstays of my recovery and to them I am eternally greatful. Stay positive at every stage along the way! Although this concept may seem difficult to comprehend, it is very important for you to embrace it. Your attitude going in does have an effect on your recovery. Both the American Cancer Society and Canadian Cancer Society are great sources for information. Both operate toll-free information hotlines and have local offices across respective countries. Movember is annual, month long celebration of the moustache, highlighting men's health issues - specifically prostate cancer. 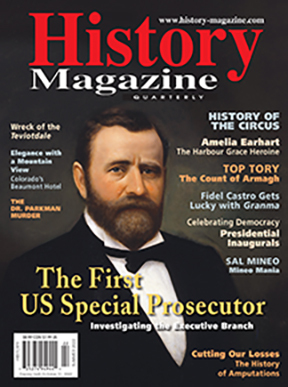 Many of you out there are researching Civil War ancestors and you may find a new special edition of History Magazine useful as a reference to what life was like for those ancestors during that period. 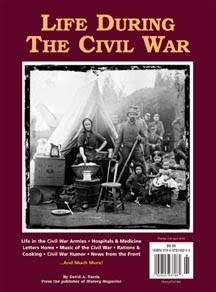 Life During the Civil War is a 96-page, soft cover anniversary edition celebrating History Magazine's launch 10 years ago. Available direct from the publisher by calling toll-free at 1-888-326-2476, by visiting history-magazine.com/civilwar.htm, or from newsstands by November 1, 2009. Yes, the wedding took place on Saturday, and all is well. Now the blushing bride and handsome groom are off the the annual FGS Federation of Genealogical Societies conference. This year it will be held in Little Rock Arkansas. There is still time to register. If you'd like to stop by the Utah Genealogical Association's booth to advertise Salt Lake Institute, I'll be hanging out there most of the time. We're even planning to have a little wedding cake to celebrate, and you are invited! Note I'll have a new banner for Genealogists in Second Life. So this is the year the family organization finally convinced you to take over the family newsletter, eh? You know you've dreaded the thought of revamping the layout, but where can you turn for assistance in taking your family newsletter "from DRAB to FAB?" "It used to be that catching up on family news was a weekly event — maybe a Sunday dinner at Grandma’s house, or summer nights sitting on your back porch enjoying an ice cream cone with your father or a favorite aunt. In today’s fast-paced society, with families scattered across the globe, for many of us those personal one-on-one moments are few and far between. A printed/digital publication is a good way to bring everyone together again. But it doesn’t have to read like the teleprompter of the evening news." Prolific writer and genealogy instructor, Lisa A. Alzo provides five categories to consider when adding pizazz to your family newsletter. Ol' Myrt's grandchildren will like Lisa's suggestion to use Discovery Education's Instant Puzzle Maker at www.puzzlemaker.com. Be sure to see Lisa's "Take Your Family Newsletter from Drab to Fab!" in the July/Aug 2009 issue of Discovering Family History magazine on pages 52-53. When visiting with a newbie to Second Life yesterday afternoon, a new friend mentioned she has Labradorian genealogy research on her father's side of the family tree. I didn't realize until this morning that Elizabeth Lapointe provides insights into Newfoundland and Labrador genealogy. So to get Belle started on the right track, here's a bit of Elizabeth's advice concerning cemetery research. "The Family History Society of Newfoundland and Labrador has done some excellent work in getting the transcription of gravesites completed. There are nearly 1,000 cemeteries transcribed and, if you know where the community cemetery is, you can go to their website to see if the headstone was transcribed for that community. They have nearly 800 transcriptions in the database so far and you can request a search of their database for a fee. You can also go to www.stonepics.com, where they have a quarter of a million names and dates from headstones and monuments in Newfoundland. There are also pictures of some 1,700 cemeteries in the 177 volumes available for purchase on CD." You'll probably also wish to visit Elizabeth's website www.GenealogyCanada.com. Lapointe, Elizabeth. "Exploring Newfoundland and Labrador Genealogy. 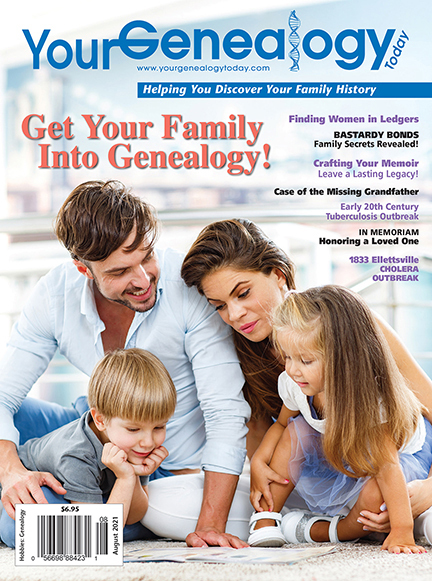 Discovering Family History (magazine). July/August 2009. pages 8-11. August 10 – August 15, 2009. The staff of the New England Historic Genealogical Society invites you to participate in our classic intensive weeklong program, “Come Home to New England.” Research your roots with expert assistance at the extensive NEHGS library, one of the premier facilities for genealogical records in the world. Whether you are a first-time participant or have enjoyed this program in the past, you are sure to benefit from a visit to our library and extended time with our staff of professional genealogists as they welcome you “home” to New England. Throughout the week of guided research, you will have the opportunity for one-on-one consultations, daily lectures and special extended library hours. To register please call 617-226-1226 or mail payment to: NEHGS, Education/ Tours, 101 Newbury Street, Boston, MA 02116-3007. Sounds like a real opportunity to attend a daily class, and have on-site research assistance. 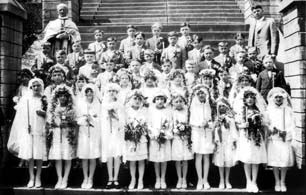 When discussing French-Canadian ancestors, Richard Crooks discusses baptismal parish registers “The first fact encountered is the date of the event. It is important to note that the event being recorded is the baptism and not the birth. The date consists of the day of the month, the month and the year usually written out in words instead of numerals. If you need a little help deciphering the date, Family Search has a helpful French Genealogical Word List found at www.familysearch.org/ENG/Search/rg/guide/WLFrench.asp that not only includes numbers, dates and times but also includes a list of several hundred key genealogical terms.” SOURCE: “Find Your Francophone Ancestors”. Discovering Family History. May/June 2009 pages 49-51. This reminds Ol’ Myrt that there are a number of genealogy word lists. Hope these help you decipher those old documents. Here are guidelines with sample letters to be used when writing for official records in a foreign language. If your ancestors lived in the greater London area from after about 1665, then you’ll appreciate hearing about "The London Gazette: Published by Authority", an article by David A. Norris posted in Internet Genealogy magazine in the December/January 2009 issue. “For such a long-lasting institution, the beginnings of the London Gazette were a quick stop-gap measure to deal with one of London’s worst disasters. Bubonic plague broke out in the city in 1665. King Charles II moved his court to Oxford, and many other Londoners who could leave also did so. The plague was so contagious, the courtiers feared any contact with London at all, even with its newspapers. To convey important news, the government started an official newspaper, which they called the Oxford Gazette. When the plague subsided, the newspaper was relocated with the royal court and continued as the London Gazette." The London Gazette may mention court cases involving ordinary citizens, according to Norris who also notes the archive is online at www.gazettes-online.co.uk . Pictured above: Future prime minister Winston Churchill appears in the London Gazette on 23 June 1896, when he was promoted to first lieutenant in the 4th Hussars. Because of such notices in the London Gazette, “gazetted” came to mean “promoted”.